Former Ukrop Party leader and businessman Hennadiy Korban has returned to Ukraine, Dnipro Mayor Borys Filatov has said. He posted a photo on his Facebook page on which he hugs Korban. The report says that they stay in Dnipro. "He has come back, my best friend… I always knew that this would happen," Filatov wrote. As reported, Korban was arrested on October 31, 2015. On November 4, he was notified on suspicion of committing crimes under Part 1, Article 255 (setting up and participation in a criminal organization), Part 3, Article 157 (obstruction of election commissions' activities), Part 5, Article 191 (embezzlement of money of the National Defense Fund charity organization in a large scale), Part 2, Article 289 and Article 349 of the Criminal Code of Ukraine (the seizure of hostages). Korban was placed under house arrest. On December 28, 2015, Kyiv's Dniprovsky District Court decided to change the measure of restraint for Korban from house arrest to detention for a period of 60 days. 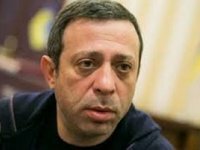 On February 22, 2016, the court extended Korban's detention until April 15. However, on March 15, the court changed the measure of restraint for Korban from custody to house arrest. Later, Kyiv's Pechersky District Court allowed Korban to go to Israel for medical treatment. In September 2017, Korban said that he intended to return to Ukraine soon.